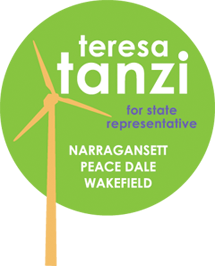 Wakefield, RI – This Tuesday, June 29th 2010, Teresa Tanzi officially announced her candidacy for State Representative of District 34, including Narragansett, Wakefield and Peace Dale. 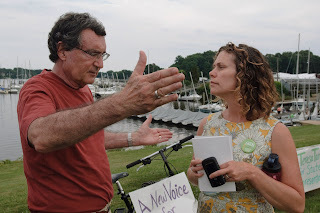 Tanzi is running as a Democrat and will challenge the ten-year incumbent, Rep. David Caprio, in the primary election on September 14th. In addition to Tanzi and her campaign manger, Libby Kimzey, three community members added their voices in expressing support for the campaign. Alan Woodmansee, local engineer and sailor, Ann Marie Denelle, school and family advocate, and Leslie Chouinard, Peace Dale Neighborhood Revitalization Inc. President, spoke about their different backgrounds and reasons for supporting Tanzi. Their message was clear: the community wants a new voice representing South County in the State House, and they want Teresa Tanzi to be that voice. 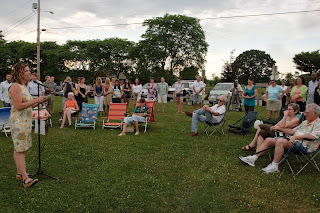 The announcement event was followed by a reception fundraiser at Hanson’s Pub on the pond, featuring music by local bluegrass band Saddle Up the Chicken. The night marks the most recent of several important developments in the campaign, including highly successful volunteer drives, neighborhood canvassing and an enthusiastic outpouring of support at community events.